Hello there lovelys, my name is Lucy Rose. i'm 20 years young, living in the Lake District studying to be a teacher. Somewhere along the lines I managed to become wrapped up in a love affair with the world of beauty. Thank god I did! If I had not I wouldn't of become part of the amazingly spirited blogging community. My blog is still fairly new, but I have loved every minute of picture taking, post writing, editing, commenting, reading and watching! Blogging gives me a great sense of belonging, and I'm super duper happy to have made some great friends and met so many lovely people through this. My self confidence has increased majorly since meeting such amazing people, and I really do love and appreciate all the comments, tweets etc I receive. Bloggers are the best! If you decide to swing by lucy rose you can find a bundle of posts, including hauls, reviews, OOTD's, wish lists, life posts and some other ramblings. I have been sharing my mental health story on my blog, part 2 is due soon. This is something I'm very involved with and feel strongly about so if your interested too then definitely check that out! I am also about to host a giveaway so check back for that. I'm in the middle of a blog layout overhaul so hopefully lucy rose will be looking more beautiful for you soon. When I first started blogging almost three years ago now, I didn’t think that it would change my life quite as much as it has done. Through writing my fashion and beauty blog, WhatLauraLoves, I’ve really found me- who I am, what I like and what my style is. My blog is an expression of me as I write about all things fashion and beauty related with a bit of wedding talk thrown in for good measure as I’m tying the knot next year! Blogging has brought me some close friendships and amazing opportunities, like being able to design, model and put on sale a dress exclusively for Simply Be. Head on over to my blog to read all about the products I’m loving and the clothes I’m wearing... oh and there’s a huge giveaway coming up at the beginning of July! 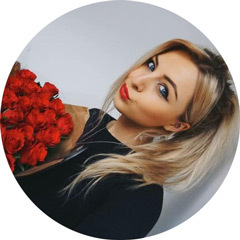 Hi girlies, I'm Lucy, I'm 24 and I run Lucy Loves To Blog. I've been blogging for a couple of years now after being an avid reader of fashion, beauty and lifestyle blogs. Lucy Loves to Blog started off as a lifestyle blog but has gradually turned into a fashion/beauty blog which I never thought would happen as well as posting about my life in Devon. I love sharing new products and clothes I've brought in haul posts, reviewing new beauty products I've purchased and dressing up for outfit posts but my most popular posts are probably the wishlists! I'd love to see you over at Lucy Loves to Blog. My names fatin and you can find me on www.ohmygoshmake-up.com. I'm a 27 year old dental nurse who's love for make-up is just beyond purchasing and collecting. I'm originally from nottingham and came to Londonderry about 9 years ago! Being middle eastern my parents were really strict so make-up up to the age of 18 was a no no! My first purchase was from Mac itself and I had bought my first product which was a lipstick called hue! We all know about this beauty! Since then I have been a massive fan of beauty and all things fashion related. I studied a levels in art, textiles and sociology. I have a qualification in styling but since being a mum, my career took a different turn! Hi! My name is Tori and I blog over at aztecmess.com, I started my blog about a year ago after realising I spend half my time reading blogs so I may as well try my hand at writing my own! My blog started out as quite nail-art related however now it has expanded into a full beauty blog with the occasional lifestyle and fashion posts thrown in for good measure. I’ve just finished my degree so I will be focussing on making my posts even better and hopefully posting a lot more often! I hope you go check out my blog and say hi to me on twitter! Finally I just wanted to say a big thank you to Kayleigh for letting me advertise with her! Hi, I’m Cat and my blog started as the usual beauty blog with a bit of fitness and health thrown in; however over the past 18 months it has turned into so much more. After seeing that my fitness related posts were the most popular they grew in frequency and I took my own advice and motivated myself; as a result I have lost 20 inches, 3 dress sizes and gained a whole new lifestyle. My blog is now crammed full of fitness, food, health, lifestyle and beauty. With regular features such as “Fitness Friday” “Monday’s Meals” and “Wednesday’s Workouts” I aim to motivate myself as well as others and try to make fitness and health accessible, easy to understand and not intimidating. I am always available for help and advice as I love to help others reach their fitness and health goals, like I am. When I’m not busy finding new workouts, recipes and health tips, I am busy blogging beauty and my life. Like all girls I adore beauty products so they feature often on my blog, and I blog about life in most posts as I love to share with you all. If you want some fitspiration while reading a beauty blog then be sure to give my blog a visit, I hope you enjoy reading it. I’m a 20-year-old Journalism student who loves nothing more than writing and talking about beauty! My blog ranges from reviews, collections and favourites covering make-up, skincare and nail varnish. I’m a relatively new blog but deciding after years of reading other people’s why not start my own? I try to write my posts similar to the ones I like to read and love hearing from anyone with the same passion as me (aka going on and on about beauty!). I also enjoy any suggestions readers may have for any types of posts you like to be covered so feel free to send any requests my way too. Hello there fellow blogger, I’m Emilie an 18-year-old beauty and fashion blogger and lover with a big heart, a coffee addiction and an obsession with TV shows. But most of all I am an ambitious life lover with passion for adventure. For the past 4 years I have been on and off the blogging wagon, but ever since September 2012 I am on it for what I think will be a good, long while. My little corner of the Internet is where I share everything from beauty tips and tricks to reviews, hauls and I even pop in with a few fashion and travel posts from time to time. Ello loves! I'm Ashley & I blog over at J'aime Ombre. I've been a licensed cosmetologist for nearly 9 years with a particular love for all things hair extension related. Everything's better when you look like Rapunzel, amiright? After being a dedicated blog reader for a few years I decided it was time to give it a go & try it out for myself. My blog is mainly beauty focused with a little sprinkle of fashion & life mixed in. You'll find lots of reviews and far too many shopping hauls. I'd love for you to pop over & say hi sometime! I hope you enjoyed finding out a little bit more about my wonderful advertisers and have possibly found some new blogs to follow. I certainly know they'll all be on my reading list from now on. I still have a couple of ad spaces remaining for July so if you're interested, don't hesitate to get in touch at kljohnson1990@gmail.com. nice! thanks for sharing these blogs... will check them out now! Some fantastical blogs! Going to have a look. I love finding new blogs to have read of and this is a great way to do it! I your blog and I will for sure checkout those blogs and follow and I hope you will check out my blog and follow too.